The second harmonic of the output of a Ti:sapphire regenerative amplifier (395nm, 1kHz, 200fs) is used as the pump light. 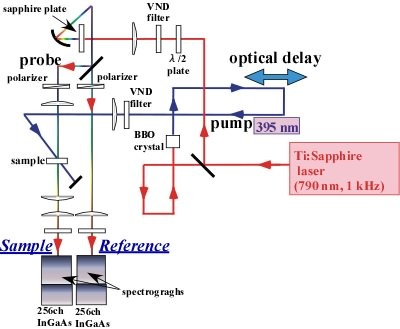 The white light obtained by the self-phase modulation with the same amplifier output on a sapphire plate is used as the probe light. 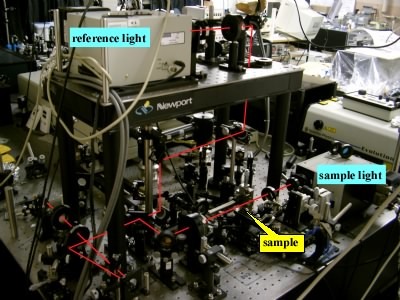 Two sets of near-infrared polychromators and InGaAs array detectors (256 channel) are used for recording reliable time-resolved near-infrared spectra. Spectral coverage of the polychoromator is 900-1500nm. When TiO2 is photoirradiated, electrons and holes are generated. 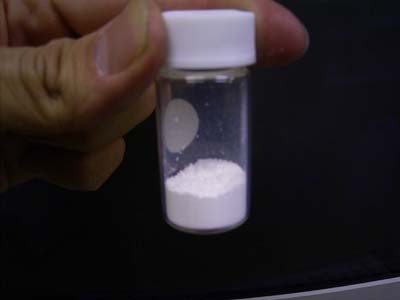 They eventually oxidize or reduce the reactants on the surface of the TiO2 particles. Direct absorption measurements with NIR. In the near-infrared region, transmittance of TiO2 is large facilitating the direct transmission measurement of absorption. Transmission measurement is possible in the near-infrared region (900-1600nm). 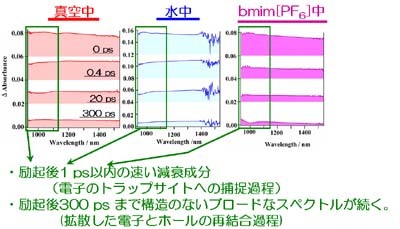 We can measure the early-stage dynamics of charge carriers photogenerated in the TiO2 powders. Copyright Hamaguchi Lab. All rights reserved.